Video game stuntman coming to Apple devices, courtesy of Hello Games. Since 2010, PlayStation 3 users have enjoyed Joe Danger, the light-hearted and fun platform racer from Hello Games. It was so well-received that the company chose to bring this title to Xbox Live Arcade last winter, and now, we just received word that Joe will bring his over the top stunts to iOS. The news comes from a recent Gamasutra interview, where Hello Games co-founder Sean Murray admits to learning the ins and outs of the operating system. That said, this version won't be a port, but instead a reworked edition that takes advantage of the iPhone and iPad touch screens. In fact, Murray hopes to have it running at 60 frames per second. 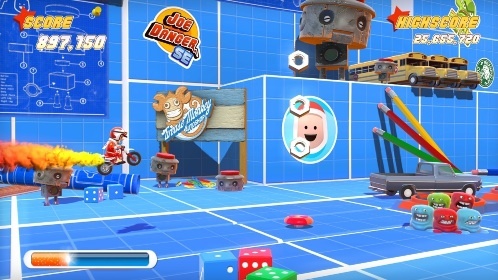 "Joe Danger is a game with a lot of depth to the controls. We want to make very much an arcade game on your mobile. You swipe the screen to make Joe wheelie, you nudge him in the air to affect his gravity, you can flick a barrier out of the way, or wrestle with the shark in the shark tank. You have such control that levels that would be impossible on console are much easier on the touchscreen." We missed out on this gem twice, and look forward to finally getting our hands on it later this year.